Alexander Gray Associates presented a selection of work by Melvin Edwards (b.1937), spanning his five decade career, including large-scale sculpture, works on paper, and examples from the artist’s renowned series “Lynch Fragments.” Coinciding with the artist’s critically acclaimed retrospective, organized by the Nasher Sculpture Center in Dallas and the Columbus Museum of Art, OH, and on the heels of Edwards’ participation in the 2015 56th Venice Biennale, Italy, the works on view presented an intimate portrait of the artist as a committed sculptor, deeply engaged with formal concerns and socio-political narrative. Also on view were early works on paper that Edwards produced using spray paint and watercolor to imprint the negative of two elements: chains and barbed wire. 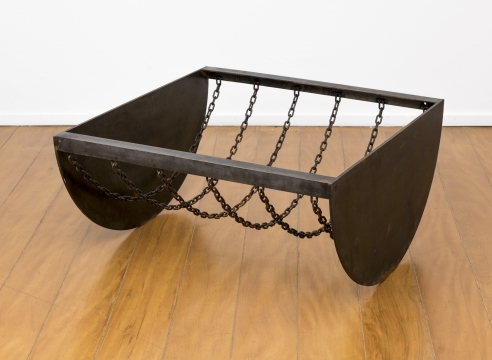 These two components would become key in his barbed wire installations exhibited at the Whitney Museum of American Art in 1970, the first solo exhibition of an African-American sculptor at the museum. The artist’s use of these materials in his two-dimensional work stems primarily from formal concerns, as he explores the aesthetic qualities and complex historical meaning behind this medium.